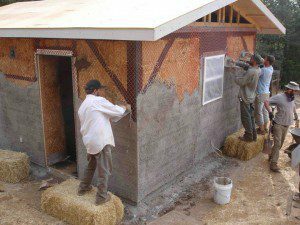 I wanted to share a (relatively long) conversation with you all about failures of lime plaster over a clay base that is happening now on a straw bale list serve. This conversation sums up what I have been seeing and hearing about quite a lot in recent years: failures of lime over clay plasters. I hope everyone considering this option reads this conversation and changes their mind. Here’s the letter from Chris, the man whose plaster has failed. My response is below. As I mentioned in an earlier post, I’m building a small straw bale home in western Oregon. Since I’m largely inexperienced in straw bale methods, I’ve used the literature (with the help from a builder or two) to help inform my decisions on specific details, and for our upcoming bale plastering, my consultations have led me to seriously consider the application of an initial earth discovery coat with a lime finish on the external walls. This method is widely touted by just about every bale book I’ve gotten my hands on, as well as in articles in The Last Straw However, I’ve come across a few cases (mostly in the archives of this list serve) of plaster failures at the earth/lime interface. It seems like these have been the result of one or two factors: improper keying of the lime coat to the earth discovery coat, and differential swelling of the clay against the lime when the wall gets heavily saturated. All this thinking about external wall renders has led me to wonder why there’s this disconnect between what the books/articles recommend and a the experiences of a few unfortunate folks. Are failures rare enough to still warrant the application of lime over clay? Or, as more buildings stand up to the test of time, will this technique be less enthusiastically endorsed? I’m curious to know what folks think. We’re one of those failures. We live in a very wind-blown, cold wet in the winter location. After doing all our research, talking with experts, etc we decided on earthen covered by lime. Seemed ideal for a SB in our area. Since we have access to an entire dry lake made of clay this was perfect. We did multiple batches and put the samples on bales. Left them in the elements. Recorded our results. Chose the best. Were meticulous about our formula. AND all the walls done this way failed. We finally removed it all off two long protected walls and put up just lime. We have two more short walls to remove and redo with lime. It’s HARD when you think you are finally done with your house to go in and rip it apart again! Earthen plaster doesn’t stick to chicken wire over wood. No one might say lime is easier to work with but we like it. We like working with it and we like the way it functions after drying. Of course it took me quite a few failed attempts to LEARN lime!! We had HIGH hopes for earthen covered by lime but now wish we’d never done it. IF we had to do it again we would try to standardize EVERYTHING. 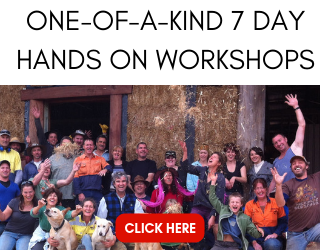 We would test the clay and we would test each batch of manure (or just use straw and test it!) AND each final batch of plaster. The variables in earthen just seem to be quite broad and not as easily controlled as using lime plaster. For those of you SB experts- please don’t flame me. I KNOW there are probably many things we did wrong- but just like most owner/builders and most SB builders, thats the name of the game. You shouldn’t have an entire system fail when you are attempting to do everything right after research. THAT learning curve is too expensive. This is our experience, and simply our opinion. Perhaps it will help someone else avoid the pitfalls we fell into and discover a way to make earthen/lime work well!! Hi Chris. First of all, I’m very sorry to hear of your plaster failure. That must be very disappointing and emotionally taxing. I have seen and/or heard of a lot of failures of lime over clay plaster. I have been recommending, for years, that people not do it. There are different reasons for the failures, but they all come back to the fact that there are two different materials that simply don’t easily work well with each other. Like you said, it is a very steep and expensive learning curve. I’m sure there are places where this has worked that we don’t hear about, or perhaps those are destined towards failure in the future as well, who knows. I suggest to people that they either do an earthen plaster through and through and through or they use a lime plaster. Don’t mix and match is my opinion. I am a big fan of Natural Hydraulic Lime plaster, although it is expensive. Is it more expensive than plastering a house twice because of a failure? I don’t think so,. I believe that the emotional expense of such a failure is higher than the financial expense of the NHL plaster. I am verz grateful for all the useful information that is provided on this site. We plastered our walls in a similar way (clay and then lime plaster) and I will let you know if something similar happens to us (hopefully not as I’m sure it’s very stressing so I´m very sorry to hear about Chris’experience. I am wondering now…I haven´t seen a discussion on this anywhere in this web site- tadelakt on clay plaster in kitchen and bathroom? As I understand tadelakt is a type of lime as well so I guess it wouldn´t work very well? I know that there are ways of doing it that have been successful; however, there are far more cases of failure that I have seen. I would stick to lime all the way on the exterior and save the earthen plaster for inside. After all, you don’t really need the weather resistance and durability of lime on the interior, even in wet areas like bathrooms. Earthen plaster do really well in those places if installed and finished properly. Not sure about synthetic binders as I don’t use them. What about using lime plaster over interior walls made with this technique? Would it you would mix lime instead of clay with straw and than apply clay stucco over it? HI Martin. I think this would be fine as is under a lime plaster. THere is so little clay in the light clay/straw mix, that I think the plaster would mostly be attached to the straw itself. To be safe, you could coat the wall in a lime slip prior to the first coat of lime plaster. That would help the adhesion/bonding of the plaster. I would be nervous about using lime as the slip on the light straw mix only because I wonder if it would become too dry and brittle prior to and even during installation. It might be fine; however, I have never done a lime slip with a light straw mixture. I’ve only used clay. Hi, coming to the discussion late. I have a newbie question. Is there any problem with covering an exterior SB-lime plastered wall with cladding? Is there a need for the plastered walls to “breathe”? Thank you for your help. Hi Kurt. You can use exterior cladding on a bale house. 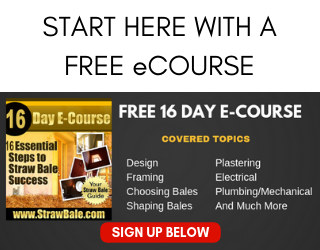 You will need to make sure to protect the bales with a scratch coat of plaster and then provide an air gap, like a rain screed, to allow the bales to breathe properly. Have you ever done an earthen plaster mix with a small percentage of powdered lime mixed in? I was intrigued to learn that this seems to be the go-to method for the New Frameworks folks. They suggest up to 15% powdered lime in the earthen base coat is compatible with a lime-sand finish. They suggest a like-to-like connection is necessary for bonding. Not too much lime in the base coat, but a little will make it possible. Haven’t tried it myself, but I’m interested. I tried this a few years ago and did not have great success with it. Although better than laying lime/sand over a clay plaster, it still did not perform nearly as well as a pure lime/sand plaster in my opinion. I am building a post/beam straw bale insert house. I am ready to put on the clay/sand/straw render on the outside. After research I have tried covering a test bale with 1 part pottery clay, two parts medium coarse sand and a bit if straw mixed in. It has been out in the elements for a couple months now and seemed to be doing very well. It has been 90’s to 100 degrees most of that time, with a few showers. When we did get a shower, it seemed to hold up very well, except on the top of the bale, which is flat. It got soft and a bit crumbly, which I expected. The sides seemed to do fine. We had a hard rain the other day, with 35mph winds beating against the side of the test bale. It now is soft and crumbly like the top was/is. This is only the first coat and is around an inch thick. Should I be concerned, or continue with another two coats? I personally do not use earthen plasters on the exterior as they will require too much maintenance for my liking. It’s not a question of it the plaster will be affected by the weather but when and how often. I prefer to use Natural Hydraulic Lime plaster. It is expensive, but it is WELL worth it in my book. I’m building a light clay bathroom extension to my house and I’m using 3 parts filtered earth from the land to 1 part hydraulic lime powder. It’s holding on the wall well but we haven’t had any rain yet. Has anyone tryed this mix? The earth has a good amount of clay and has been perfect for making cob. Hi Kenny. Personally, I am not a fan of mixing earth and lime. I have never seen it work well in the long run. I imagine there is a way to make it work, but I see a LOT of failed attempts out there. We have a 10 year old cob, light straw clay, clay waddle barn that has a lime plaster over the straight clay cob. The lime plaster over all of these is working great! 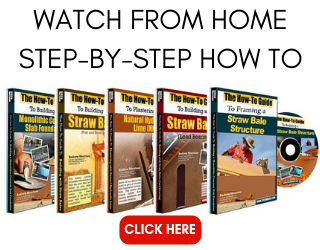 So…perhaps for these methods it’s different than for straw bale. I had also heard that adding some lime to the earthen plaster mix as a layer before a lime layer helps with it adhering. Likely it makes a difference if the wall is either still somewhat wet or is wetted before applying the lime plaster. Great to hear Laurie. I find that lime over cob tends to work well if mechanically bonded. Perhaps whomever did the original build (you?) did a great job on that bonding for the entire barn. It is not impossible to do right, just very difficult with more failures than success from what I see. Thanks Andrew for your answers to everyone here! You are doing a great service towards the efforts of all in sustainable building! Anyone know about using an “Adhesive coat” (flour paste, sand and manure) to help plasters of different base ingredients connect? My barn (see above comment) is still doing great but I have a house in an Eco-Neighborhood in Sayulita, Mexico (www.tierraluz.org) where the earth/cement/lime plaster is crumbling on the outside….not sure what to put over that now. The plaster was a Mexican technique of mixing soil with Mortar mix and sealing that with a breathable sealer. My builder from Guerrero said that has been their traditional technique for years and has always held up well. …just not for us!. Might have worked but our soil perhaps had some silt. Since there isn’t much clay in my plaster, I’m thinking that maybe the Lime plaster would work. Otherwise….thinking of a cement stucco with adhesive coat under that. Thanks for you or anyone else wrapping their brain around this one if you ahve time! I would want to see the removal of as much of the crumbling plaster as possible before adding new material. I would stay away from cement and stick with lime (“cal” in Mexico). Just make sure you get a high quality lime, not a standard construction grade. You could also consider an earthen plaster like what Athena Steen is known for. She does amazing work at the Canelo Project in Arizona. Hi Andrew, I was wondering if you have heard anything about a method recommended by Michel of Trans Mineral USA in California, suppliers of good quality NHL limes… He’s says that the trick to applying lime over clay plasters is to spray the clay plaster with a 20 to 1 lime water mix, saturating it thoroughly the day before then lightly just before applying the lime. I imagine keying into the clay would be important too, but this spraying idea he says is the only way to do it, and that it works well. I am thinking of trying it on part of my straw bale house. I am in an arid area (Arizona), but we get sideways monsoon rains that pelt my house, and destroys my clay plasters each year. I could remove all the clay plaster and start over, but I thought I’d try this first, or at least in a section. Thanks. I have heard of this from Michel. He knows what he is talking about; however, I have seen people mess this up. To me, it’s a fine line between it working and a failure. For me, I want my plaster to work well and to only have to be applied once (it’s a LOT of labor). I prefer the three coat consistency. I had extensive conversations with Michel about this. There’s a lot of information on their website, including specific guidance for plastering lime over adobe, straw bale, and clay. As practice for the main house, we just plastered a frame-construction shed. We covered the entire thing with two-ply tarpaper and then expanded metal mesh. Then we put on two layers of clay plaster – one to fill the mesh, and the second to provide bulk on top of that. We recently completed the first coat of lime, NHL 3.5 1:3 with masonry sand and 3/4″ fiberglass fibers. (1:2 cracked too much). Our situation is especially challenging. We are in the Utah desert and temperatures can reach 110°. We did encase the entire shed with tarps, encountering another daunting challenge – spring is the windy season here, and we’re talking 50 mph. This required replacing a lot of grommets. Everyone has told us that you cannot apply lime plaster in hot dry conditions. Nevertheless, we persevered. We were fairly scrupulous about misting it frequently, even all night long. After two weeks, it has hardened into a cement-like finish with a few small drying cracks, and appears to have adhered to the clay just fine. At first we did try spraying lime water on the clay. This was difficult because the sprayer kept clogging up and the overspray is really hard to remove. We ended up just misting with water as we went along, and we did scratch the clay coat. I think on the house I may brush on a lime wash over the clay, assuming that won’t destroy the clay! Remember, the shed is a test for the main house. I think we’ll hold off on the house until August, because it’s just as hot and the wind should have lessened by then. As soon as I find a source for reasonably-priced pigments we will do the finish coat and experiment with colors. I would really appreciate hearing from anyone else who has attempted lime plaster in a hot dry climate. I know Andrew does not like lime over clay, but we are lucky in that our climate is in general very forgiving for straw bale concerns. Hi Colleen. Great idea to practice on a smaller structure. I have seen time and again where people have applied lime plaster in the heat and have seen it fail. It can be done, yes, but you have to be VERY careful. If it dries to fast, it WILL fail. I suggest you take a rubber mallet to the walls you have completed and test them out. Gently tap them with the mallet and then hit them a touch harder. Nothing like slamming a hammer in to the wall, but putting enough force into it to see if there is a quality bond or not. This can be the tell tale of truth when just looking at the wall makes it seem like it’s fine. We did this test in Arizona last year after a PROFESSIONAL crew had plastered an entire garage. It took very little impact from the mallet before ALL of the plaster fell off. It looked great visually, but was a disaster waiting to happen. Luckily, we tested things before the house was plastered. Be sure to apply in the shade and to keep the plaster moist as long as possible. Be sure to PRE WET the walls the night before you continue with the second and final coats. This will help a LOT. We’re planning on going with lime render on all 3coats. We’ll be using polyester strapping for the compression. Will the lime affect the strapping at all? And if so is it enough to be a concern? Hi Michelle. I don’t think it will be a problem as the plaster will bond to the bales ultimately, locking things up tight. That said, if you’re not using mesh on the walls and relying solely on the strapping to hold things together, then you will want to be absolutely sure the strapping won’t fail under the plaster’s alkalinity. You may want to pin some burlap over the strapping just to give it a little separation from the plaster as a form of “cheap insurance”. Good luck. Hi Ronnie. I have seen so many failures of lime over earthen plaster that I hesitate to suggest it for you. That said, with the right expertise, it CAN be done. I suggest you check out the articles I have on the site about the process and see if it’s a fit for you. Although more expensive in the short run, removing the earthen plaster may be less expensive in the long run if it is done in a way that provides for a superior and long lasting finish. Good luck and sorry I don’t have better news. Hi, I built an outdoor oven from cob last year. Over the cob are a few coats of lime plaster. I covered the oven over the winter with a plastic sheet. When I uncovered the over this spring there were numerous cracked areas. I had plenty of lime plaster (already hydrated) left over so I chipped away the cracked areas and replastered with the left over lime mixture. My problem: the new coatings are not adhering to the existing layer. They are cracking as they dry. I try ‘burnishing” the layers, pressing them into the existing layer but the new layers just won’t adhere. I do apply a water mist to the existing layer prior to adding the new plaster layer. I also cover the new layer with plastic to keep it from the air. Any suggestions would be helpful…. thanks very much. Hi John. Thanks for your message. As you likely read in this blog post, it can be really hard to successfully work with lime over clay. The main two reasons are that the two materials do not bond well by design (having different properties) and that the two materials move differently. In other words, the clay is soft and flexes UNDERNEATH the more rigid lime which causes the lime to delaminate from the clay. There is not much that I can offer in a repair as I just avoid the combination of the two materials entirely just to be safe. You can find some information on how to perform the work as a “best practice” on http://www.limes.us. I don’t know exactly where to find the document on their site, but they have a ODF that speaks directly to how to make this combination work (as best you can). One thing for sure is to make sure the plaster (original plaster) has enough water to support the new plaster. If the wall is too dry, the old plaster will steal the moisture from the new plaster and cause it to fail. thank you for the reply, Andrew. I appreciate your taking the time to answer and will check the link you posted. HI! Thanks for your useful information and thanks for sharing your experiences! So the lime PLASTER does not work on a clay Plaster, so it is the same for a lime PLASTER on a clay Base wall? I mean does lime PlASTER works on a clay BASE(not Plaster) wall? Great distinction. To be clear, it is possible to have success with lime over clay (plaster or base wall), but it’s not easy and most fail. It is primarily because the two mediums do not behave in the same manner and that causes separation. This would be true over plaster or base wall material. Sorry but can I ask another question? Lime plaster can be a coat for what kind of basic walls successfully (other than lime)? For example concrete, wood, rock, brick? You’re welcome. Lime can work over all of those materials with the right “prep work”. It is even possible to use lime over earthen plaster/cob, but it is REALLY hard to do properly in a way that doesn’t cause the failures discussed in the article. That’s why I warn people to just stay away from it. It’s far too risky for the average homeowner/builder. Thank you so much for your time, patience and helpful answers Andrew.